The Which Greek Island resort guide to Santorini gives you a list of towns, villages and resorts in Santorini and describes them telling you where they are on the island, who would enjoy them, if it’s just a day trip or a place to spend a week and what the nightlife is like too. It is meant for anyone planning a trip to this beautiful island to help them decide where to stay and where to visit whilst on the island. The map above should also help you to decide where you want to stay, the west coast is where you’ll find the Caldera views, dramatic scenery and is a popular region for sunset views. The east coast is where you’ll find the best beaches so keep this in mind when choosing where to stay. The busiest tourist resorts in Santorini are those based on the caldera side of the island as they offer spectacular views. The main ones being the capital Fira, neighbouring towns of Firostefani, Imerovigli and the northern town of Oia. There are a couple of beach resorts in Perissa and Kamari but Santorini isn’t really a beach holiday type of destination. The two previously mentioned beach resorts of Perissa and Kamari are probably the best places for families as there’s more for kids to do there. We wouldn’t recommend Santorini for youngsters though. Unfortunately the main towns and villages don’t retain much traditional character as they are so packed full of tourists. For authentic Greek charm head to Megalochori, Emporio or Pyrgos, all three have traditional houses, blue domed churches and cobbled maze like streets to get lost wandering round. Ideal for a break from the crowds. Santorini is the number one destination for romantic Greek island holidays for couples, the general idea is to get a hotel room with a caldera view and enjoyr the scenery. To do this you need to be on the volcano side of the island so the main resorts of Fira, Firostefani, Immerovigli and Oia are probably the best choices. 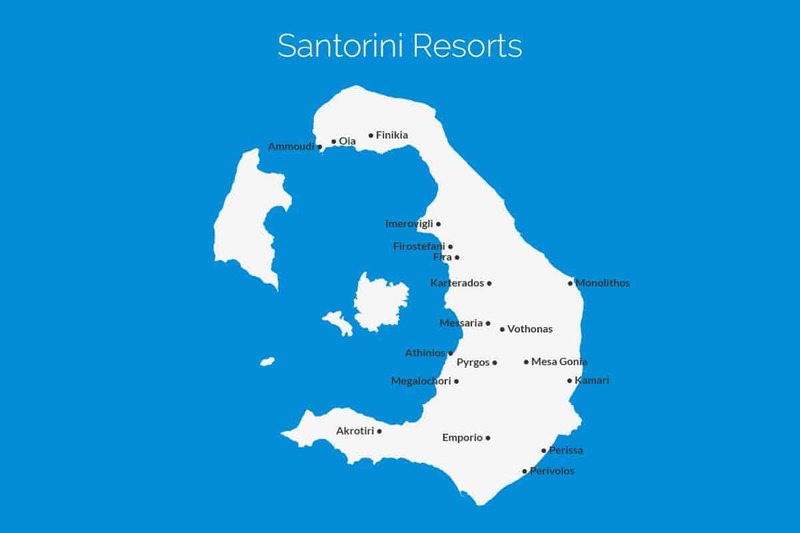 We’ve listed below the main resorts on Santorini, all you have to do is click the heading of the ones you’re interested in visiting and that’ll take you to a new page with a more in depth look at that particular town or village. Alternatively click the filters to narrow down the list of resorts to just those that have particular characteristics that you find desirable. The filters are cumulative so if you find that you’ve clicked too many and ended up with no results then simply remove one of the options that you have chosen or click the All button and it’ll reset everything so you can start again. Finikia is a beautiful village in the north of Santorini. It's set among vineyards on the hills just west of Oia. Fira is the capital of Santorini, it's a beautiful town set on the hillside with whitewashed houses and blue domed roofs. Firostefani is located just north of the capital Fira and offers similar spectacular views out over the Caldera. Karterados lies inland just 2km south west of Fira and is a traditional Greek village surrounded by vineyards. Mesa Gonia is a small and quiet rural village 8km south east of Fira and just inland from Kamari set among vineyards. Messaria is located just 4km south east of Fira and is the islands main producer of the local Santorini wine. Perissa sits on Santorini’s south east coast, it is a picturesque village with whitewashed houses and volcanic scenery. Perivolos is a small purpose built beach resort on Santorinis southeast coast below Perissa that's perfect for a quiet break near the beach. We want Which Greek Island to be as accurate and informative as possible, so, if you notice anything wrong with the Santorini resort guide or any other page please let us know. We’re also on the lookout for great photos to show people what the places we’re describing are like. If you have photos from any of the resorts in Santorini or from any of other island on the site then we’d love to see them, simply click the button below to go to the photo upload page. Thanks.